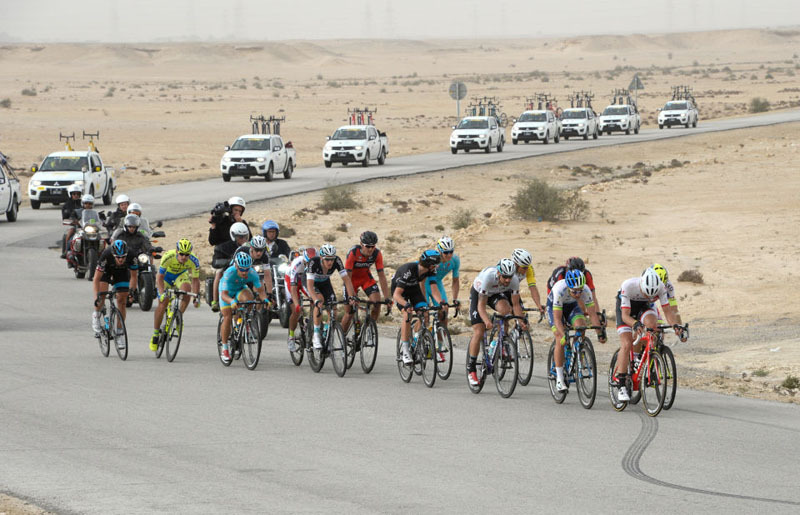 Day two of the Tour of Qatar was the scene of one of the most spectacular stages in the history of the event. 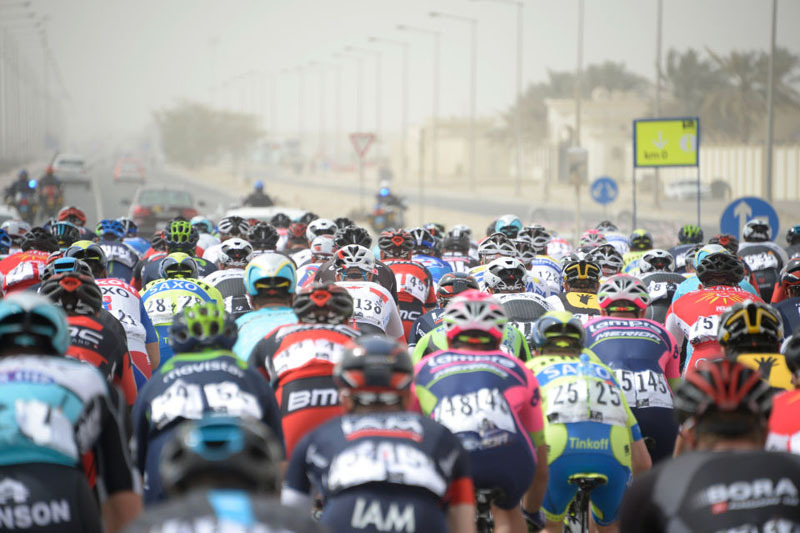 A sand storm hit the peloton in the first hour of what was to be an action packed stage. After a tremendous battle between the teams of the favourites, fifteen riders eventually went clear to the finish in Al Khor where Alexander Kristoff conquered his first ever stage in Qatar. The Norwegian beat Guardini and Van Avermaet on his way to conquering the overall leader’s Golden Jersey. While the riders had struggled against the wind on stage 1, the conditions were a lot more favourable for the second and longest day of the event: a 187.5 ride from the Al Wakra harbour to the corniche in Al Khor. The 141 riders at the start knew the wind would make the day a fast one, little had they imagined that a sand storm would hit the pack as soon as they left Al Wakra. Straight fro the start, making the best of the strong tailwind, the favourites’ teams moved to the front and manage to break the pack apart. At the front of the wind and sand swept race, where the likes of Golden Jersey Rojas, title holder Terpstra, four-time winner Boonen, as well as Sagan, Cancellara, Kristoff, Blythe and Haussler. The front group’s lead grew to 45s over the first chasing bunch but things calmed down and the peloton bunched up again at km 50 for the end of Round 1. It was then the turn of five men to break away at km 51: Morkov (Tinkoff-Saxo),Van Avermaet (BMC Racing Team), Van Zyl (MTN-Qhubeka), Wallays (Topsport Vlaanderen-Baloise) and Hayman (Orica GreenEDGE). Their advantage grew to a 1:10 at km 68 just before poor old Wallays was hit by a puncture. The front four continued their efforts and the gap reached 3:50 at km 102. At the first intermediate sprint (km 108.5), won by Van Avermaet ahead of Hayman and Morkov, the gap had dropped down to 3:30. Round 2 of the battle between favourites could then commence. Led by the riders of Etixx Quickstep, around forty riders powered away. The only big names missing where Kittel (Team Giant-Alpecin), Wiggins (Team Sky) and Valverde (Movistar). Meanwhile, the front five saw their lead drop down dramatically. They were finally caught by the Golden Jersey group at km 123. Sixty riders eventually bunched up together again before another big explanation occurred. This time 36 strong men made a difference. A decisive move that Cancellara (Trek Factory Racing), Kittel (Team Giant-Alpecin), Bouhanni (Cofidis, Solutions Credits), Valverde (Movistar) and Wiggins (Team Sky) missed out on. The second bonus sprint (km 157.5) was clinched by Boonen (Etixx-Quick Step) ahead of Maes (Etixx-Quick Step) and Burghardt (BMC Racing Team). As the pace continued being impressive, several riders failed to keep up. White Pearl Jersey Arnaud Démare (FDJ.fr) was the first to be dropped. Then came the turn of overall leader José Joaquin Rojas. The Golden Jersey would never manage to move back to the front. With 25 kilometres to go, only 15 riders remained at the front: Terpstra, Boonen, Maes (Etixx-Quick Step), Sagan, Bodnar (Tinkoff-Saxo), Stuyven (Trek Factory Racing), Burghardt, Van Avermaet (BMC Racing Team), Kristoff (Katusha), Guardini, Tleubayev (Astana), Rowe, Stannard (Team Sky), Blythe (Orica GreenEDGE) and Haussler (IAM Cycling). 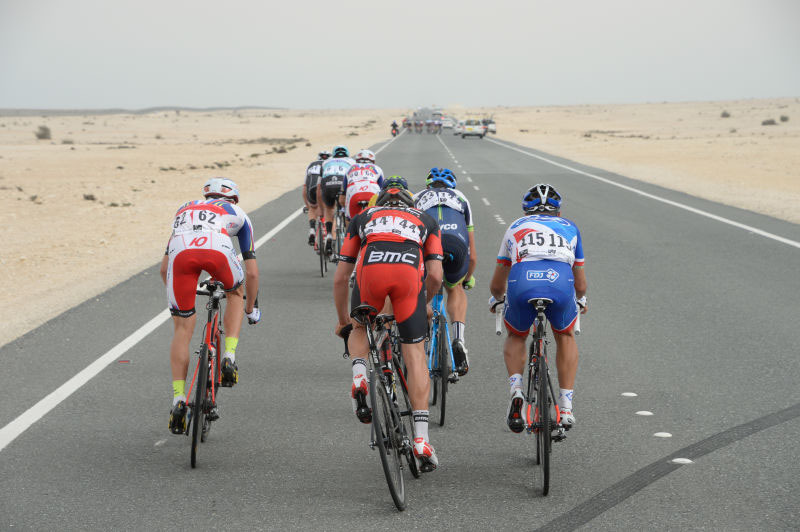 The front group remained together all the way to the Al Khor Corniche. Despite a few attempts, victory was to be decided after a group sprint. Without the slightest team mate, an exhausted Alexander Kristoff flew to victory claiming his first ever success in his sixth appearance at the Tour of Qatar. Winner of Milan-San Remo and two stages of the Tour de France last year, the 27-year-old Norwegian adds a prestigious win to his victory record by beating Guardini and Van Avermaet to the line. Kristoff takes command of the GC with a 1s lead over Boonen and 3s over Van Avermaet and will be wearing the Golden Jersey on tomorrow’s individual time-trial. Fifth on the day, Tom Boonen captures the Silver Jersey (points classification) while Peter Sagan claims the White Pearl Jersey for the best young rider. 13 Luke Rowe (GBr) Team Sky all s.t. 15 Ruslan Tleubayev (Kaz) Astana Pro Team s.t. 33 Ralf Matzka (Ger) Bora-Argon 18 all s.t. 59 Dmitry Kozontchuk (Rus) Team Katusha all s.t. 79 Adrien Petit (Fra) Cofidis, Solutions Credits all s.t. 115 Preben Van Hecke (Bel) Topsport Vlaanderen-Baloise all s.t. 122 Ariel Maximiliano Richeze (Arg) Lampre - Merida all s.t. 139 Lars Boom (Ned) Astana Pro Team all s.t. 13 Adam Blythe (GBr) Orica GreenEDGE all s.t. 24 Ralf Matzka (Ger) Bora-Argon 18 all s.t. 26 Daniel Schorn (Aut) Bora-Argon 18 s.t. 28 Roger Kluge (Ger) Iam Cycling s.t. 48 Boy Van Poppel (Ned) Trek Factory Racing all s.t. 55 Jelle Wallays (Bel) Topsport Vlaanderen-Baloise all s.t. 58 Dmitry Kozontchuk (Rus) Team Katusha s.t. 64 Marco Haller (Aut) Team Katusha all s.t. 71 Dmitriy Gruzdev (Kaz) Astana Pro Team all s.t. 75 Zakkari Dempster (Aus) Bora-Argon 18 all s.t. 79 Fabian Cancellara (Sui) Trek Factory Racing s.t. 81 Tom Stamsnijder (Ned) Team Giant-Alpecin s.t. 96 Filippo Pozzato (Ita) Lampre - Merida all s.t. 108 Victor Campenaerts (Bel) Topsport Vlaanderen-Baloise all s.t. 115 Matteo Bono (Ita) Lampre - Merida all s.t. 117 Gregory Rast (Sui) Trek Factory Racing s.t. 125 Lars Boom (Ned) Astana Pro Team both s.t. 134 Shane Archbold (NZl) Bora-Argon 18 all s.t. 136 David Boucher (Fra) FDJ.fr s.t.